At Manchester International School we ensure that students who receive formal education with us are very well-prepared for further study and work. In particular, we focus on developing a range of `soft' skills such as time management, critical analysis and independent thinking than their peers who follow the local and national qualification programmes. Students here develop great regards and appreciation for different cultures. Their education helps them to develop an inquiring mind. The regular co-curricular and extracurricular activities like Sports, Games, STEAM HUB etc expands their intrapersonal skills and self-management skills. Due to participation in these programs students are less likely to experience behavioral problems and also show improvements in focus and drive; these activities also help children to develop confidence in problem-solving skills and critical thinking. We believe in shaping the students to become the leaders of tomorrow. The global nature of today’s economy requires people who can maneuver through different cultures and languages and we aim to fulfill this requirement. We provide valuable career guiding opportunities by giving cross cultural knowledge and future educational advices. We Manchester International School truly aspire to give global education to our students, who will surely thrive to make a difference in this world by engaging purposefully with their responsible actions aimed towards care and sustainability of the planet and its peoples; they will grow to see a holistic view of world affairs, and peaceful collaboration between nations. 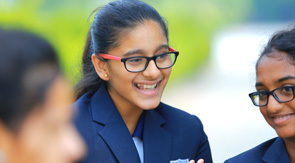 We can whole heartedly say that students who study at Manchester International schools will always feel confident when looking for career opportunities because of their exposure to various world cultures, strong communication skills and excellent academics through the national and international curruculums like CBSE, IGCSE, AS & A Levels, IB PYP & DP.